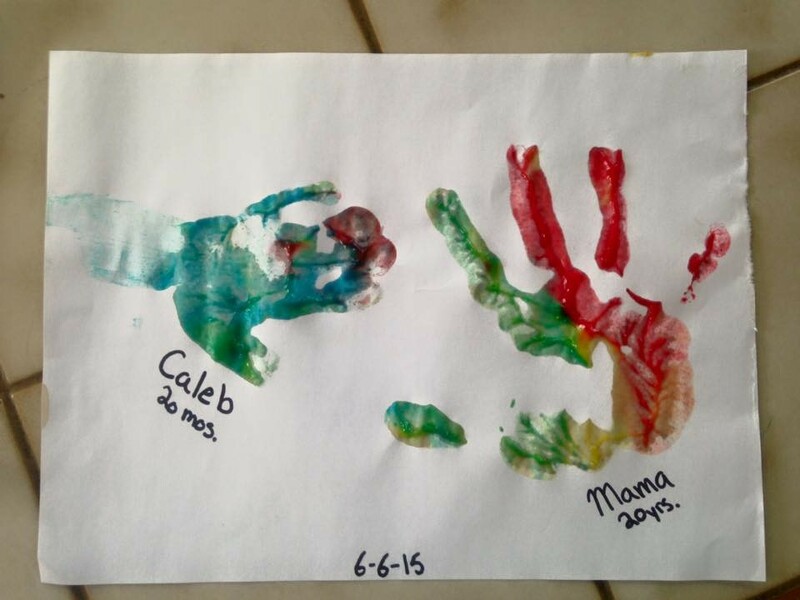 When Caleb was 6 months I first posted about this edible finger paint I like to make for him. 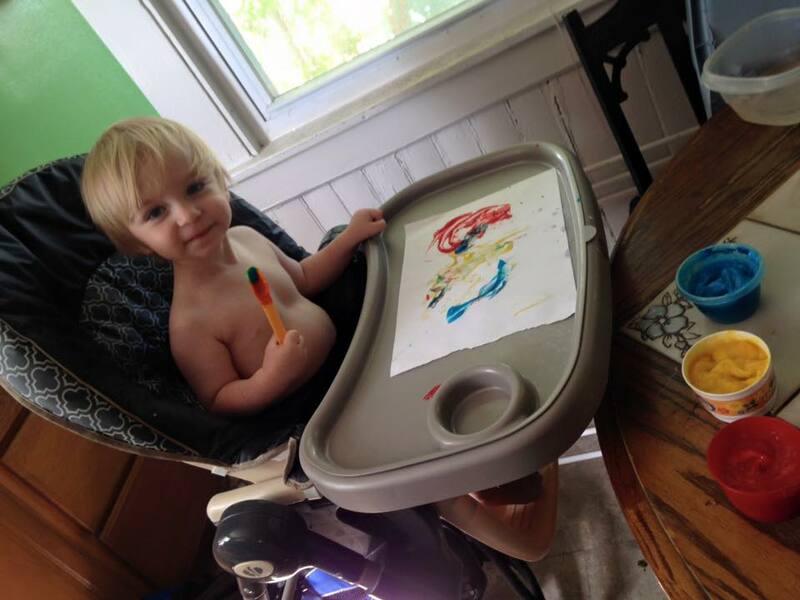 The other day we were feeling a bit creative (aka Caleb was trying to draw on everything in site) so I pulled out the paint, stripped him down (well, I threw this pair of boxers my nana gave him over his diaper so it wouldn’t get dirty), and plopped him into the high chair. 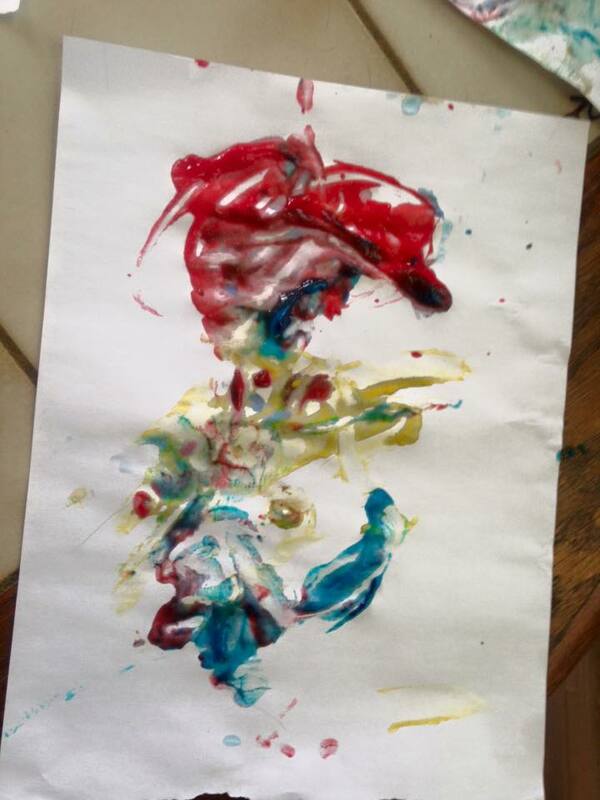 I had some paperwork to fill out so while he was painting, I let him have at it so I could get my work done. 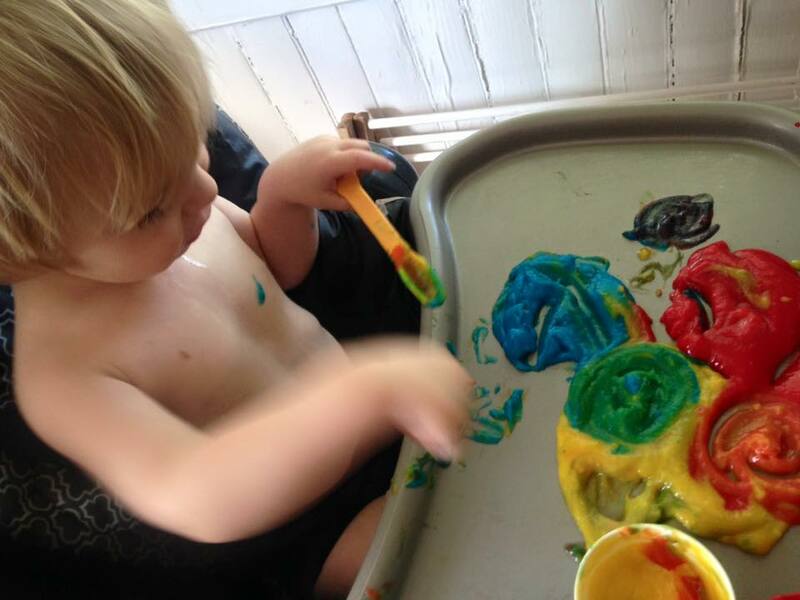 He started out like any other day, pushing the paint around with his fingers and spoon. 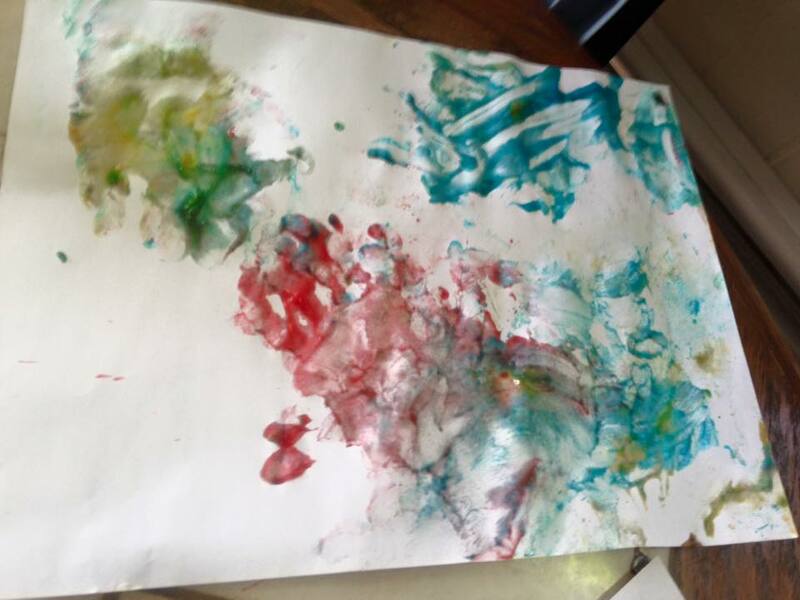 Then my curious little boy decided it would be so much more fun to toss the paper away and dump the paint right onto the tray to play in. This, was the first step to a great educational activity. 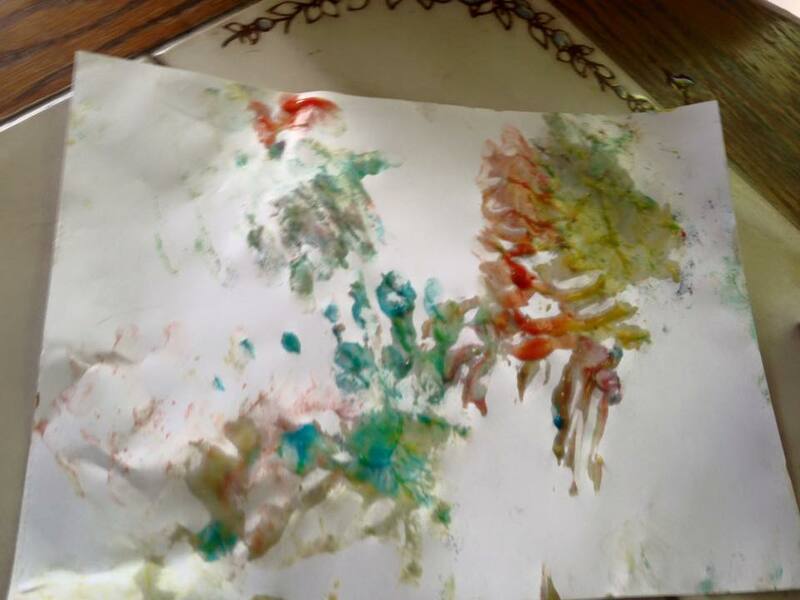 He started to mix the colors together so I put the paperwork aside and we talked. First we named the three main colors. Red, Blue, and Yellow. I asked him to mix together the blue and yellow. Once he saw the green, he shocked me by pointing out the fact that it was, indeed, green. He wouldn’t say the other colors but he would point to the correct one when asked. We mixed up orange and purple as well. This simple activity, that didn’t take more than a few moments to transition into, was so much fun for the both of us. I could have just pointed to colors in a book or shown him a video. Instead though, he was able to see in front of his own eyes, using his own hands, how mixing two colors would create something completely new. I asked him today, totally to show off, not going to lie, what blue and yellow make. He said green. That’s so awesome to me. We made a little keepsake for this cool activity. 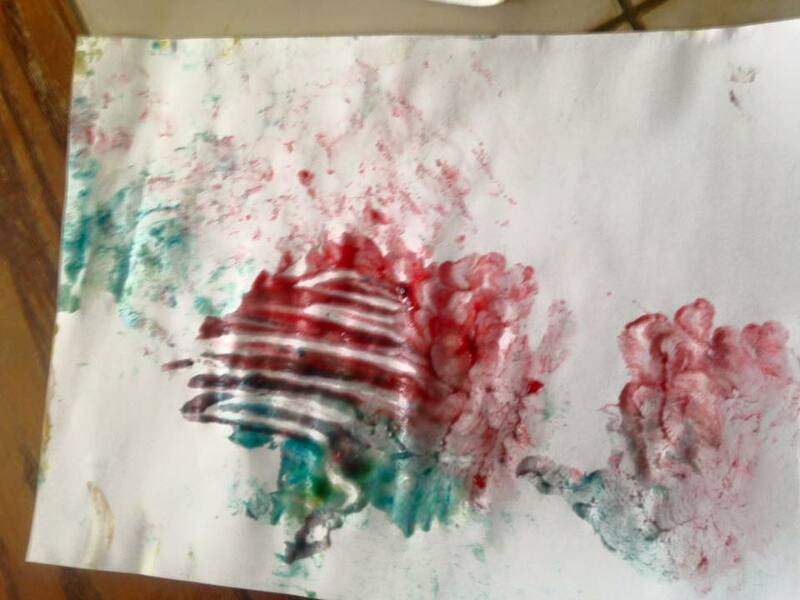 So now just because I can’t resist, here’s some of the paintings he ended up making after our little color mixing lesson. 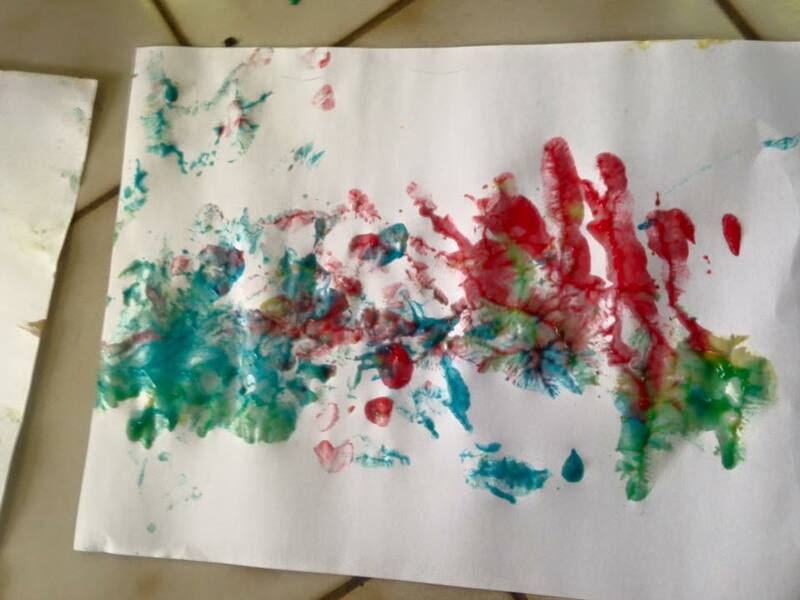 They were all created by him smacking (booming) the paint and then smacking the paper. Learning to Read/Identify Items and Words: The importance of availability. Last Sunday I had a party and while I was cleaning up and getting ready for it I made a terrible mistake. I put Caleb’s books on the very top shelf of a shelving unit that’s tucked away into a corner. Usually he has full access to his books and he’ll go over, grab one, and plop himself down to look through it. Once in a while he’ll even bring the book to me and read it to me in his sweet little babble. Every day we read together. That means very different things on different days. Sometimes he just wants to hold the book and turn the pages after I only get a word out. That’s okay. I’m not going to force him and make it any less fun for him. Other days he’s perfectly happy to snuggle up in my lap and allow me to go through each page, read the words once or twice, and point out all of the little details such as what color someone’s eyes and hair are or who’s taller or shorter in the scene. No matter what, when he brings a book to me (or when I call him over to read if it’s getting late and he hasn’t shown interest yet) my goal is to make it fun so that he never feels like reading is a chore. Well, this picture is a few days old. I have seen the error of my way. How dare I put his books so high up and expect him not to do something scary like climb up onto the back of the couch to get them back! He showed me that our approach to reading and learning is working. He showed me that he does enjoy our time together, learning about a world beyond our own and even closer (as in every day life) and that what we’ve learned has stuck with him. After seeing him so desperate to get to his books I decided from now on he will have a little library set up in every room. Yes, that includes the bathroom! This is the time to start the building blocks of tomorrow. Kids are awesome. Dani is my niece that I put on the bus half the time. Usually Caleb is still sleeping by then (and Corey is sleeping right next to him) so he gets to stay home. Today though he got up with me at 6:30 so I decided to get him dressed and have him come with me. Goodness I’m so glad I did. Dani and I always stand in front of these stairs/this ramp while we wait for the bus. While their was snow I’d throw her on top of the snow and chase her around a little but mostly it was just cold and we would just stand there and shiver. This morning though, these kids had an absolute blast. 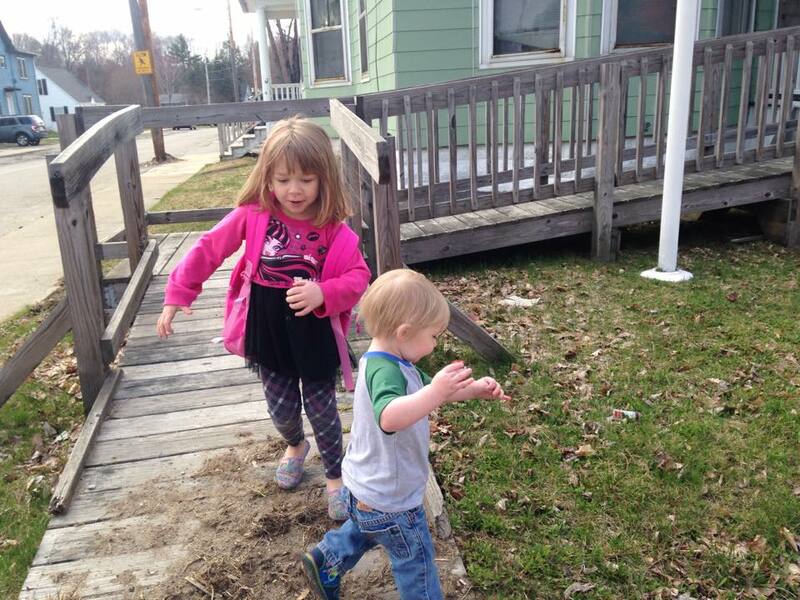 They were playing “tag” and the side walk was safe. They had to keep running up the ramp though and the stairs were off limits because they were too dangerous to run on. The kids set all the rules, Caleb didn’t even try to run into the street, and for the whole ten minutes we were out there neither got bored. It was their imagination that fueled the fun. I could have said, “No, no, kids. That’s not our stairs. Stay down.” I could have said, “I don’t think so Caleb, those stairs are too dangerous for you.” I could have said, “It’s too dangerous being near the road, come stand with me.” I mean, Caleb’s only one. Trusting him to run around near a road makes me incredibly nervous. I trust them though. I trust them to make good choices. I trust that Dani wont let Caleb get hurt. I trust that they wont be too loud in front of someone’s house. I trust that they are capable little people who aren’t going to get hurt from running around on a few stairs and a ramp. That trust allows their creativity to shine, for them to learn important things such as boundaries, and to grow as people in general. I just wanted to share this happy little moment in my day. These kiddos make me so happy and proud to be a part of their lives. Before Caleb was born Corey and I had this crazy idea about spanking. What was so crazy about it? We thought it was a great idea. Why did we think that exactly? Why did we think that hitting a small child who can’t fight back would be a good idea? Why did we have no problem with that when hitting any adult would be considered assault and have a chance of landing us in jail? Well, it’s what our parents, like most parents, did. We didn’t seem to have any negative outcome from being spanked. That left us with the question of how to discipline our little boy. I started to research the different methods out there and something that really stood out to me was the difference between Discipline and Punishment. The easiest way to put it I think is that Discipline is teaching a child how to act the way they are expected to in a positive way rather than making them feel bad about themselves without really learning a lesson. Punishment is often associated with the negative and ends up with a child thinking, “Mommy’s so mean!” Discipline often ends with a child understanding what they have done wrong and learning how to be “better.” I’m no expert, I really can’t put into words as well as I’d like to the difference, but it is an important one. 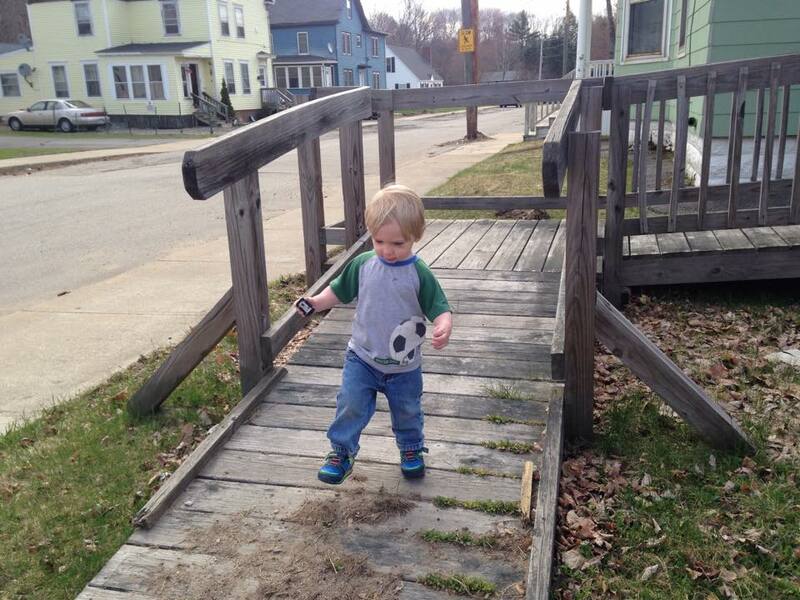 Right now Caleb is 18 months old and kind of a trouble maker. He has no fear which unfortunately means my daily level of fear has gone up three fold. Climbing, all the time, is all he wants to do and frankly it just isn’t safe. He’s already gotten himself a good shiner from climbing on his desk and slipping as he tried to get down. 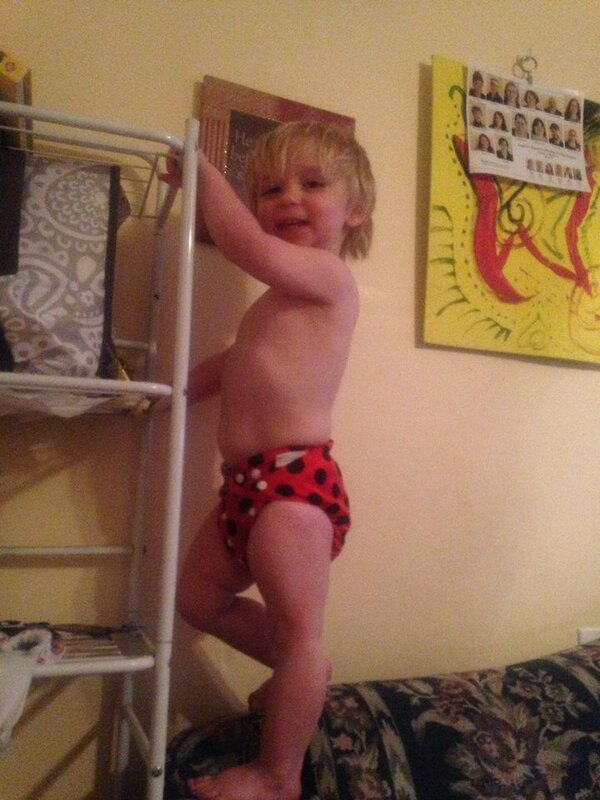 How do we keep him from climbing on things when he wont listen, like any normal 18 month old, to our requests to do just that? This is where Discipline comes in. Frankly there aren’t a lot of things you can do. We’ve already said no to spanking (which includes popping or slapping any part of his body.) He’s too young to really understand how serious I am when we say no. So what is there to do? Science has shown a big reaction like yelling or freaking out will only reinforce the action. Children are looking for a reaction. Good or bad, any reaction will make them want to do the action more. That’s not to say when they aren’t being safe that you should just ignore it. The worst place my son like to climb is our tv stand. It’s narrow, the TV could tip on him, and it’s higher up than he could fall without being hurt. Whenever he climbs up there, which is getting less and less thankfully, I take him down without saying a word or without any expression on my face. I sit him down on the couch with me and that’s that. I know it doesn’t sound like much, but please remember that he is only a year and a half old at this point. How much does he really understand? Right now the best way to keep him safe and out of trouble is to take him away from the situations. Same goes for when we are out in public. The whole, I’m not getting my way and want to throw a tantrum, thing started a couple of months ago. We ignore it and walk away. That fit ends within seconds. He gets himself together and follows us after he sees that he isn’t getting a reaction and that we’re leaving. We could make a big deal about it, try to drag him onto his feet, yell at him… It wouldn’t have the effect that walking away does. So, what happens as he gets older? Right now I watch a five and ten year old regularly. I have to take a very different tactic with them. They can understand when I say no. They know right from wrong. Again, hitting isn’t even on the spectrum of a solution. 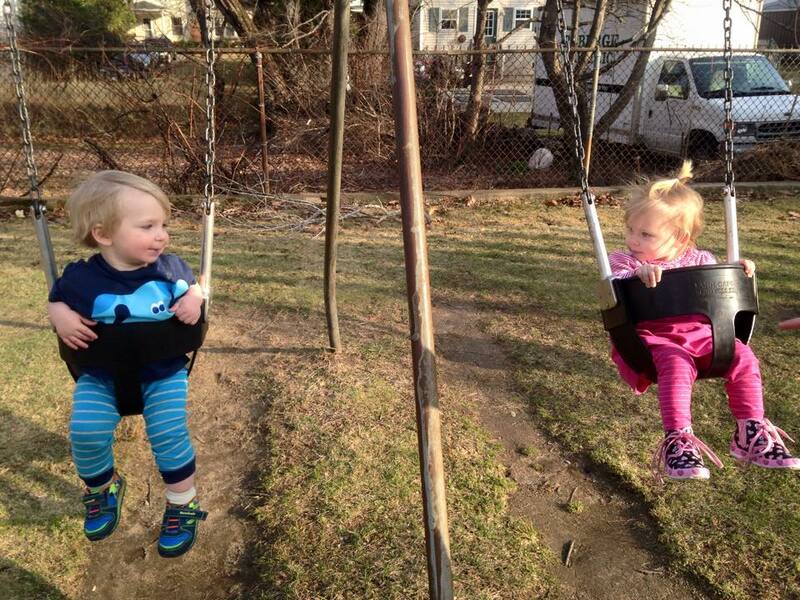 What is a solution, and has worked amazingly on both of these kids, is something that just felt right to me. If they lie, don’t listen, throw a fit, or anything else that requires discipline I tell them in an even voice to sit down. The first week or two that I was watching them they would sit down and have a tantrum in the chair. Yelling, hitting it, telling me how mean I am. I’d let them throw the fit and I’d just wait. Eventually they’d calm down and I’d just talk to them. I’d ask if they knew why I asked them to sit down. The five year old usually just shrugged her shoulders but the ten year old would tell me why. Either way I would tell them why I asked them to sit, explain why I didn’t like that action, and I’d ask if they thought they should be doing it. If they said no, they could go do something else. The ten year old I’d sometimes have do a chore like take out the trash. After that they wouldn’t do the action again. Months later, working with this form of Discipline, the kids have many an amazing transformation with me. I wish I could say more, but just know that the ten year old has become a whole different person. It seems so simple, it almost seems like it isn’t discipline, but it works. There is a term I’ve heard used that I really love. “Train UP a child.” This means to show them how you’d like them to act and rather than telling them no all the time, telling them what you’d like to see instead. One great example is going to the grocery store. Rather than going in and saying to the children, “Don’t touch anything. Don’t run away from me. Don’t ask for anything.” try a more positive approach. “Please stay with me. Hand on the cart please. Sorry, we aren’t getting that this time. I understand you are disappointed but not this time.” It’s amazing what happens when you parent in a positive way. These little changes, these simple ways of disciplining children, have made my life better and a lot less stressful and I hope it can help you as well. After high school I really drifted away from any friends I used to have. More than that, after Caleb came I realized how different my “friends” and I really were and decided that parting ways would be best for both Caleb and I. That’s okay. Eventually though, without even knowing it, I found myself very lonely. All the play groups and classes in the world couldn’t make up for just plain out not having friends. For Caleb, he has his cousins and what not but they are all bigger than him. They aren’t on the same level as him which made it hard for both of them to really play and interact properly. I was feeling pretty bad that my child was as alone as I was. We have each other of course, and that’s enough for me, but I knew that having friends would be better for us both. Well, one day I went to the crochet group I started and I met Amy. She brought her daughter Alyara with her and in the middle of our meet up had to nurse. It was an insta-connection. Alyara was only a month younger than Caleb and super cute. Amy’s friend Brittney ended up booking a Thirty-One party through me a few weeks later and all of the kiddos were invited. 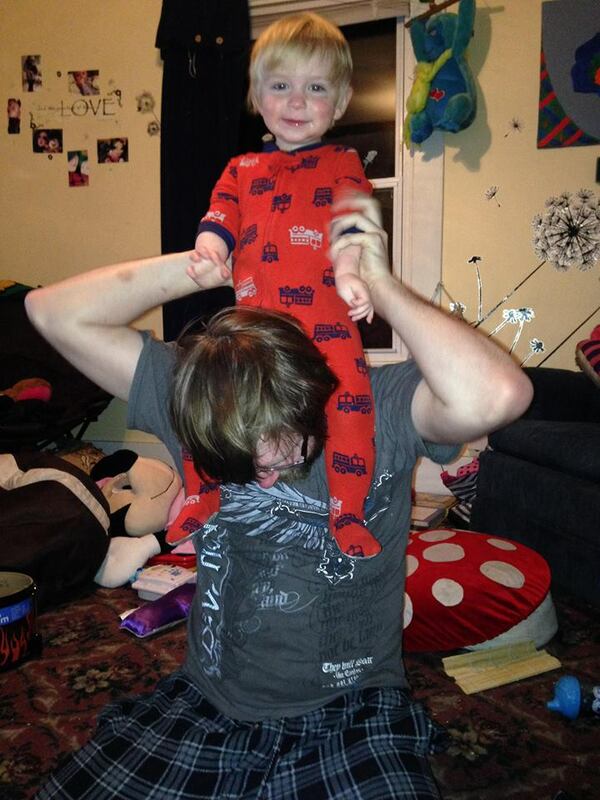 Caleb and Alyara met that night and oh my goodness they were adorable. He would hold her hand and snuggle up to her… and she’d put her hand out and push him right away from her. Oh yeah, we know who wears the pants in that relationship! That night there was another kiddo present. 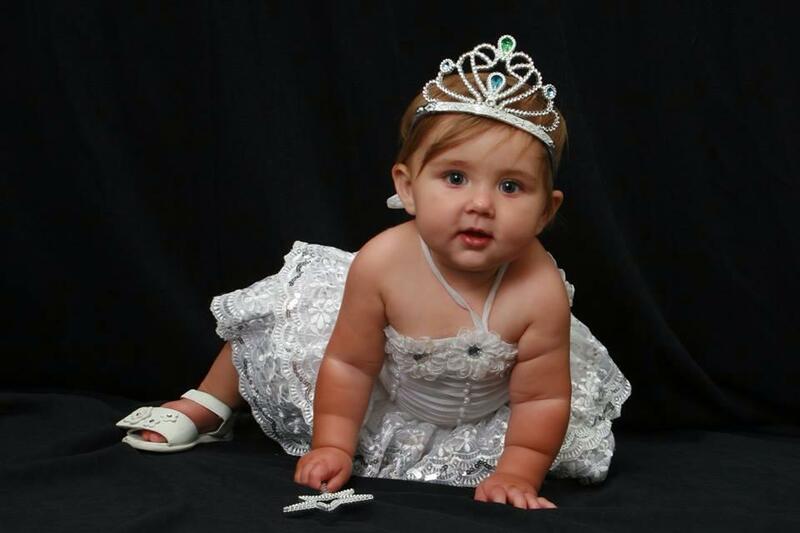 Sharlett, Brittney’s daughter, who is only a couple of weeks younger than Caleb. They didn’t bond much that night but… the story doesn’t end there! The three of us started hanging out and our little ones did as well. Watching them play makes my heart sing. The way we feel says a lot as well. 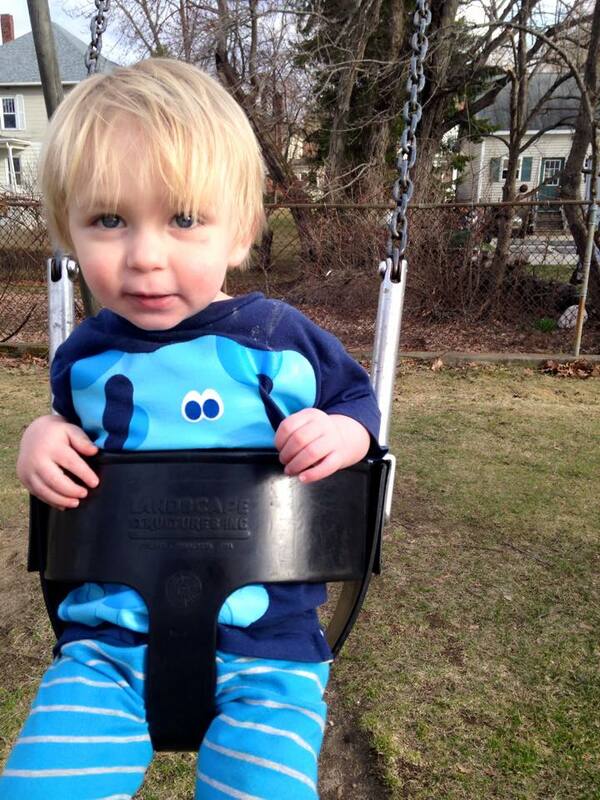 Caleb and I are both a lot happier and less lethargic having something to look forward to, aka our play dates. Sharlett and Caleb have found a special bond though. Both are charismatic kiddos who love the park and food. They play so well together and I can’t get over just how cute they really are. I mean… just look at this! So go make some friends mommies! You will feel so much better, you will not have as much stress, and your little ones will have someone to spend time with as well. I mean, hopefully at least. Just, don’t be alone. Loneliness can over take you and turn you into someone you don’t want to be. Friendship is important. It’s important to show your kids how to be a good friend. FRIENDSHIP. 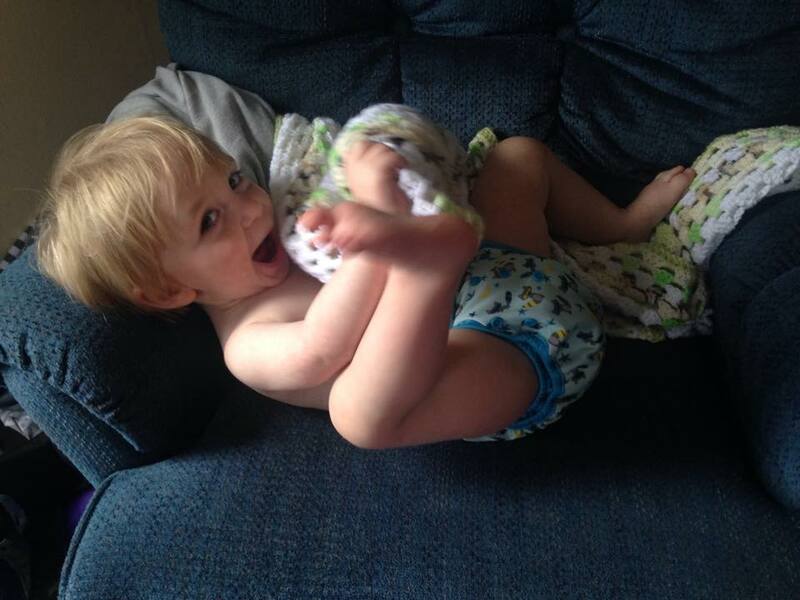 My sweet little barely eighteen month son has quite the vocabulary. Some of his favorite words include Sister (for our cat), Go, Yes, Dani, Mama, and Yum. Through the day he likes to shock me by spitting out some pretty great words such as hamburger and uncle. The best for me though? The fact that, at least 40% of the time, he has the phrase “Thank You” down pat for when someone gives him something. Warms my heart right up. Let’s be realistic though. A few words here and there does not a conversation make. Watching Caleb watch Blue’s Clues though, showed me just how well he grasps what a conversation is. In the show Steve (or Joe) goes about it essentially the same way; asking questions that the viewer can answer. He’d say, “You see a clue? 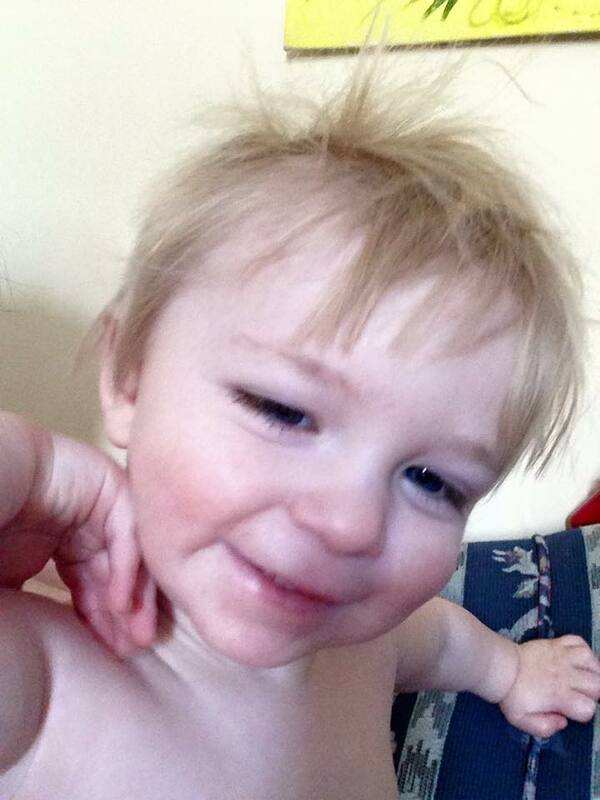 Where?” Caleb would respond by loudly babbling and pointing at the screen. It hit me that what he was doing WAS having a conversation. Someone said something to him, he responded and waited for the someone to say something else back to him. It dawned on me just how smart that really was. Words are important of course, but being able to have a proper conversation, to me at least, is just as important. So… yay! My Boy is so Blond! When Caleb was born, he came out with jett black hair. Dark as can be. Dark as mine. I was so excited that, oooo he has my hair! I should have known just from how it set, where his part was, that I was sadly mistaken. His daddy apparently was the same way though. He was born with dark hair and by two he had long, bleach blonde hair down to his shoulders. I wish I had a picture of that to show you all. The two of them are such twins. Drives me a little jealous, I wish I could see more of me in Caleb, but seeing the two together makes my heart happy. We decided that he needed a hair cut. Not because his hair was too long for a boy but because it was too long for him to function. It was stabbing him in the eyes, getting food stuck in it all the time, and tickling his back. Originally it was supposed to be just a little trim… Well, as my wonderful aunt went along she “had to make it even” so a little more than expected came off and my baby’s dark tips are now gone. My oh my, he is so dang BLOND. Everyone that knows him and sees him now says the same thing. He’s so Blond! People seem not to recognize him without a double look. He looks like a “big” boy now and it’s so dang adorable. What a milestone for us… It took a lot out of me to accept his need for a hair cut. I thought I was going to grow it out forever but it really was needed. Now he looks so dang cute and even more like his daddy. EDIT: This is just one case. No, not everyone has a period like this once they give birth. This was written because many women have this experience and it can be scary. Everyone is different. Do not take this as, YOU WILL HAVE THIS. Oh my goodness. They don’t warn you about this. No one talks about it. No one wants to talk about it but gosh do I wish I had known what would or even could happen once I finally got my period back. Let me just tell you, this is not the kind of post you want to read if you have a sensitive stomach or you are squeamish but it is something you should read if you are or soon will be pregnant. Thanks to breastfeeding I got a wonderful extra seven months of no period. It was wonderful. When I finally did get it though I had no idea what was going on and found myself in the ER. I was convinced I had internal bleeding or even that I had been pregnant some how and was miscarrying. Thankfully neither were true, which we found out after four hours, and it was just a period. It might be scary, and I can guarantee it will be gross and a pain in the neck, but it’s normal and will eventually get better. 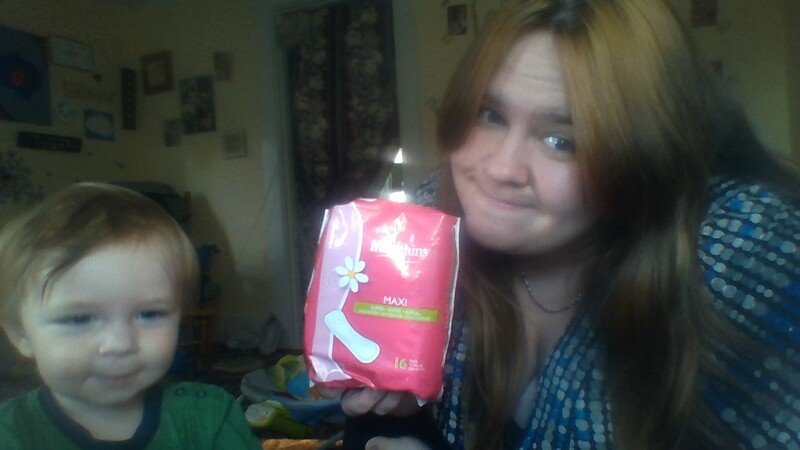 Sadly tampons tend not to work anymore (they either soak too fast or they fall out) and pads have to be the super kind. The worst thing for me is sleep. I have to get up every few hours just to go to the bathroom, gush blood into the toilet because my body doesn’t let it all out while I sleep, and change my pad. If anything seems off to you, don’t be afraid to go into the doctors though. Just know that it is NORMAL to bleed so much and to pass so many clots. Also, it can last MUCH longer. My second period lasted almost three weeks and was terrible. My first only lasted two weeks and this third one I’m hoping for a much shorter time till the bleeding stops but thankfully Ibuprofen makes it much more bearable. Thanks For Reading Everyone! Hope This Helps! Children do not spoil, food does. That doesn’t mean you can’t accidentally entitle children causing them to believe the world revolves around them and that they will always get exactly what they want. Here are three easy steps to avoiding this. 1) Don’t make your child share and don’t let them expect other children to share with them. 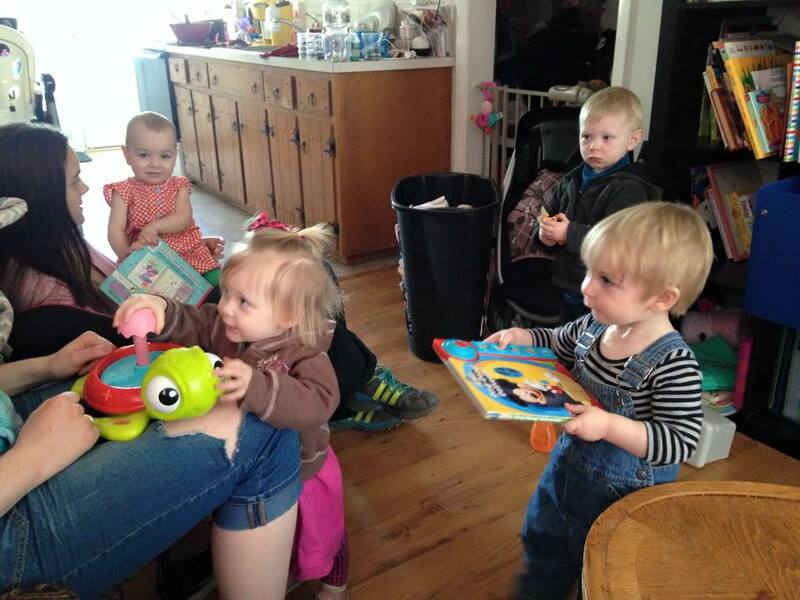 I went on a play date recently and Caleb’s friend, who is two and a half, was playing with a doll. Caleb wanted it and went to grab it from her. Her mother jumped to tell her to share and I said no. Don’t worry about it. It’s her’s. I don’t want Caleb to think that just because he wants something, he will get it. That isn’t how life works. You don’t get a car that belongs to someone else just because you want it. There were plenty of other toys so I just redirected him and he was fine. She was a happy little girl because her toy, that belongs to her, wasn’t taken away from her. She was already sharing all of her other toys and that is going above and beyond to be gracious in my mind. I wouldn’t want my one special thing taken away either. 2) Don’t be afraid to say no. I know, shocking after my introducing the idea of no post. It’s true though. Sometimes you just have to put your foot down. Times for that are like when you’re in a store. If your child is screaming for a cookie, and they’ve already had enough sugar, tell them no. Don’t reward screaming and disrespect. Instead, because we all know that the screaming doesn’t stop just because you say no, redirect. I talk about it again and again. Offer something healthy if you can afford it. Oh look at this super awesome apple. Honey you can pick out something yourself if you want but it can’t be a cookie and you can’t eat it right now. This way, their want is understood but you are leading to a better decision. 3) Money is not the only thing that makes a child happy and more over it shouldn’t be the main source of their happiness. Sadly, so many parents use money to stop crying and to make up for lost time. That’s the best way to make a child spoiled because they will forever need more to fill a much more important spot in their life. Kids don’t naturally want stuff. They just want you! The more QUALITY you time they have the less material items will mean. This means that even if you work, the time you have with them matters. Cuddling, talking, asking questions, can make your child feel loved and wanted and that need for things doesn’t even come up. A woman named Sharon Novak, who is a children’s song writer and performer, post a great article on her website that inspired me. Her article was about the value of group music classes for toddlers. I will link to her post at the end but I’m writing today because I’ve been inspired. Music has a great teaching value on Toddlers, but also has an amazing affect on milestones for babies. The picture above is a great example of this. Corey sat on one side of the bongo, Caleb on the other, and Corey would hit his side. 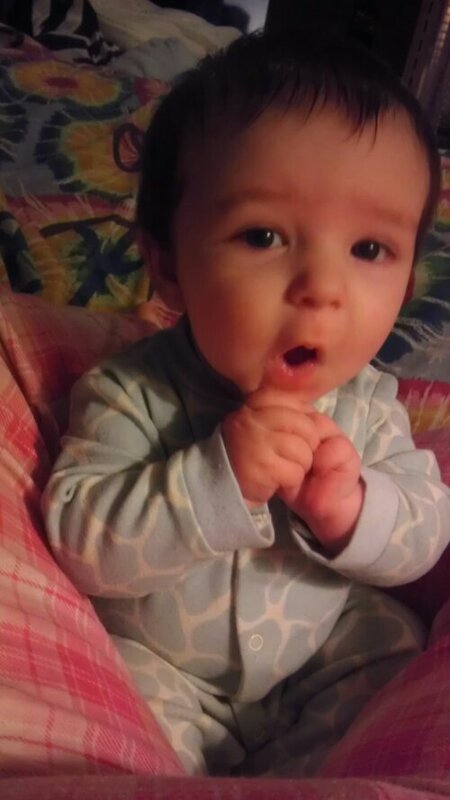 After watching his daddy made the sounds, Corey would copy him. He was still so little then and it helped him learn how to use his hands. It was a real cause and effect and a great bonding moment for them as well. 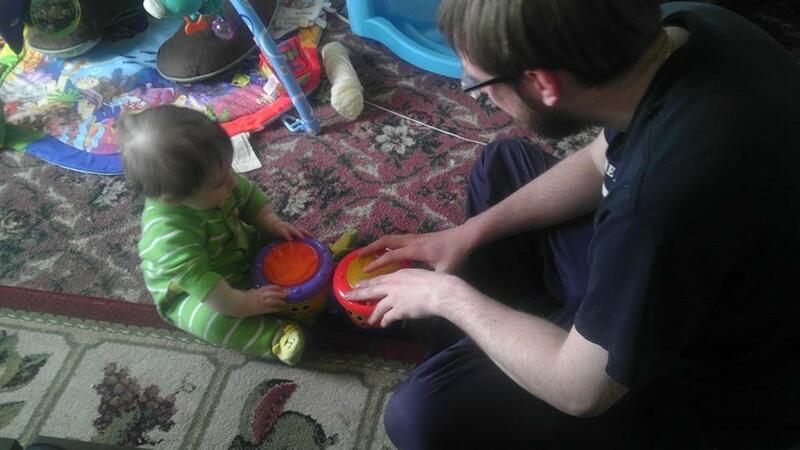 Even from birth music helps with the littlest, most important things. There was this amazing study done on premature babies. When given a pacifier it would activate lullabies to be played. They would calm considerably. These babies that were played the music had an even more amazing result though. They began to gain weight much quicker than their NICU counterparts. Playing music has been shown to improve math skills. The best time to try getting a person into learning something new is when they are a baby and their interests are just now being developed. This can be as simple as a toy guitar or drum. It’s something to make them interested in learning the real thing in the future. Another bonus is speech development. Lullabies are great because they often show simple rhyming patterns and have a lot of repetition. Like with anything, repetition is the way to learn how to speak. When a child hears the word moon over and over they start trying to say this interesting and wonderfully sung word. I personally learned how to sign through songs. I would pick a song, learn the signs to it, and later I’d remember the signs because of the song. It’s like learning a dance. It’s always easier with the music. The real point is, bring music into your baby’s life. It can be a great way to bond and soothe your child. Caleb HATES being on changing tables. Sometimes in public we have to use them. The only way I can keep him calm is by singing Let it Go. He will smile up at me and I can get the job done.